The UTEC computer at the University of Toronto was the first functional electronic computer in Canada. Left to right: Jim Richardson, Joseph Kates, and Len Casciato. Image: University of Toronto Archives, digital image number 2001-77-169MS. 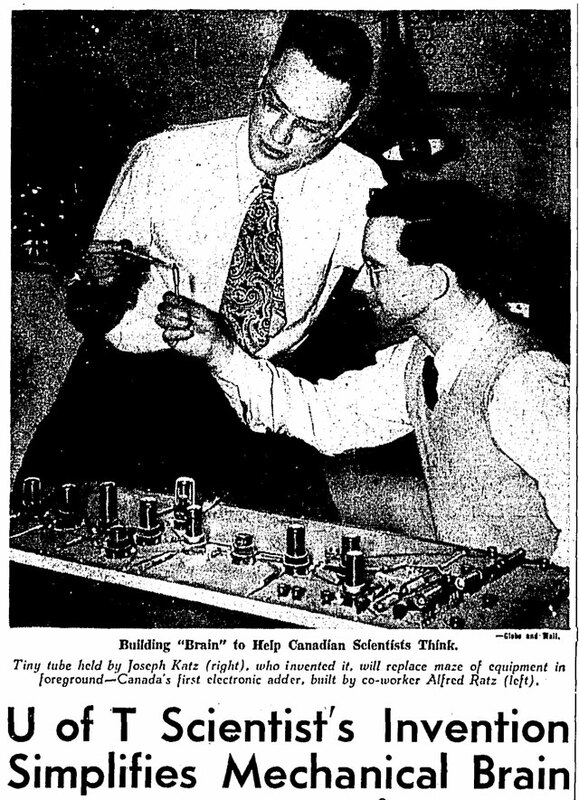 In 1949, a team of professors and graduate students at the University of Toronto began building a machine no-one in Canada, and few in the world, had ever seen before. The University of Toronto Electronic Computer Mark I—UTEC for short—was to become the first and only functional computer in the country, but first it had to be constructed entirely from scratch and many of its core components invented. “It will be able to read figures, write them down, and come up with the correct answer to a poser in calculus,” the Globe and Mail told its readers of the fantastic machine being planned by the university. In the late 1940s, practically all major scientific and mathematical number crunching was conducted by the human mind with assistance from mechanical calculators. The invention of even the most basic electronic computer (by today’s standards) promised to open the door to a new world of discovery and innovation. Calculations that would previously have taken years could be done in hours or minutes. The Globe and Mail announced the University of Toronto’s plan to build a computer in May, 1959. It would be several years before the plan was realized. Image: Globe and Mail, May 18, 1949. 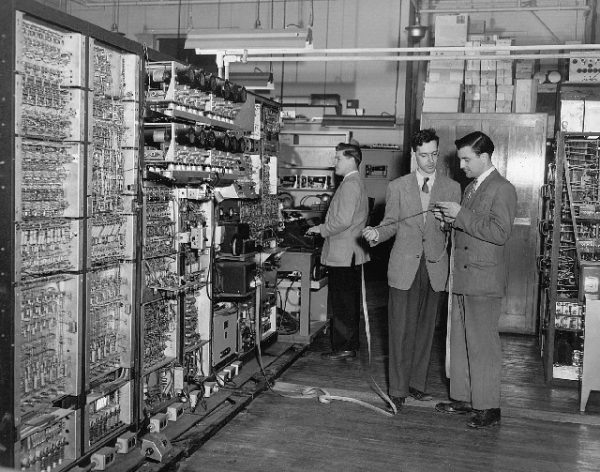 The UTEC project was the brainchild of the University of Toronto’s Committee on Computing Machines, which was formed in 1945 by professors Sam Beatty, Bernard Griffith, and V. G. Smith. That year and in 1946 members of the committee used a $1,000 grant from Canada’s National Research Council to visit universities the United States, including Princeton, to view and learn from early computer projects underway south of the border. The architecture and systems of those early U.S. computers widely: some used Bell telephone components to make calculations, others fragile vacuum tubes. Off-the-shelf parts were few in number and difficult to acquire. Components were often built entirely from scratch with wire and solder. 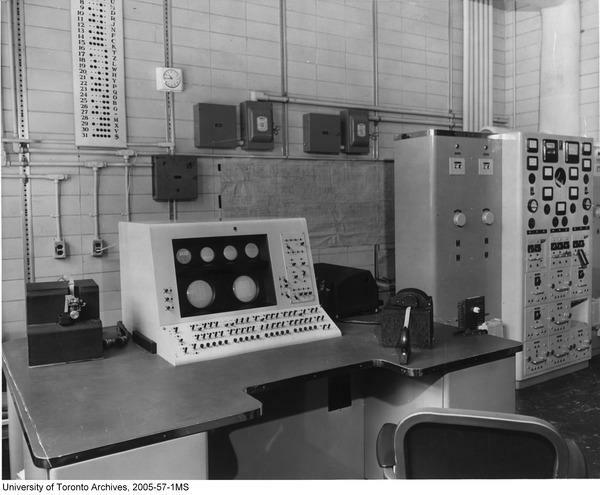 In January 1947, based on the findings from the tour, the committee formed Canada’s first Computation Centre in a room inside the University of Toronto’s physics building. Thanks to a substantial grant in September 1947 from the NRC, the centre was able to purchase several IBM mechanical calculators and hire a small staff: Beatrice “Trixie” Worsley and J. Perham Stanley, two U of T graduate students. The National Research Council agreed to fund the Computation Centre on the condition it and other universities and government agencies would be allowed to harness the power of any computer it developed. Canada’s Defence Research Board and Chalk River atomic energy laboratories were keenly interested for the same reason. In February 1948, the NRC and DRB committed $20,000 each to the Computation Centre. With that money, the centre was able to hire physicist Josef Katz and electrical engineer Alfred Ratz, two graduate students who began experimenting and developing components for the UTEC machine. Katz, who later changed his last name to Kates because he hated the “Katz and Ratz” jokes, was a pioneer in the field of vacuum tubes—devices used in the 1940s for storing computer data in memory. Born in Vienna in 1921, Kates arrived in Canada via wartime internment camps in Quebec and New Brunswick. During the war, he worked on precision instruments such as gun sights for Imperial Optical in Toronto, and after graduating from U of T he worked in the radio tube division of Rogers Majestic, a precursor to today’s Rogers organization. Although Kates and Ratz were developing parts for the computer, the centre hadn’t yet decided whether it would attempt to build its own computer from scratch or copy the design of an existing system. In August 1948, Gotlieb visited Bell Laboratories in the United States and returned with a complete set of gigantic blueprints for the company’s latest machine, the Model 6. The first electronic computers in the 1940s and 50s weighed several tons and filled entire rooms. Despite their unwieldy size and often unreliable components, these machines promised to answer questions physicists and mathematicians had puzzled over for decades. Image: University of Toronto Archives, digital image number: 2005-57-1MS. Despite Gotlieb’s best efforts, the plan to build a replica of the Model 6 was scuppered in December when Bell demanded a $25,000 license fee. On the advice of the National Research Council, the centre changed direction and committed to building its own computer. The Computing Centre would henceforth be split in two parts: the hardware division, headed by Katz and Ratz, and the mathematical division, consisting of Worsley and Stanley. Both Worsley and Stanley went to the University of Cambridge to participate in the development of EDSAC, one of the first computers ever constructed in Britain. EDSAC was almost complete when the pair arrived, so Stanley was able to have the machine make a calculation for Chalk River as a test. The resulting output, tables of complex gamma function, was likely the first data produced by a computer that had never been previously computed by a human mind. Worsley completed her PhD at Cambridge under the supervision of computer science pioneer Alan Turing and returned to Toronto in 1949 with Stanley. Meanwhile, development of UTEC continued under Kates and Ratz with their new assistants, Len Casciato and Harald Stein. Josef Kates demonstrated his Additron tube for the Globe and Mail in March, 1950. Unfamiliar with the term computer, the newspaper called the UTEC machine a “brain.” Image: Globe and Mail, March 16, 1950. During development of the computer, the hardware division pioneered ever smaller and more powerful vacuum tubes. A particularly critical insight came to Katz as he lay in bed thinking about the computer one night, he told the Globe and Mail. His tiny Binary Addition or Additron tube, which was about the size of a pencil, was manufactured by the Rogers Vacuum Tube Company. “12 of the tubes will do the work formerly done by a square yard of wires, large tubes, and connections,” wrote reporter William French. Although the Additron tube wasn’t ultimately used in the UTEC, it was successfully demonstrated at the 1950 Ex as part of Bertie the Brain, one of the world’s first arcade machines. Though the Computation Centre was making progress, it was rapidly becoming clear to Gotlieb and the steering committee that a full-scale, reliable computer was still several years away. Under pressure to star making mathematical calculations soon, the centre decided to build a smaller-scale machine for interim use. 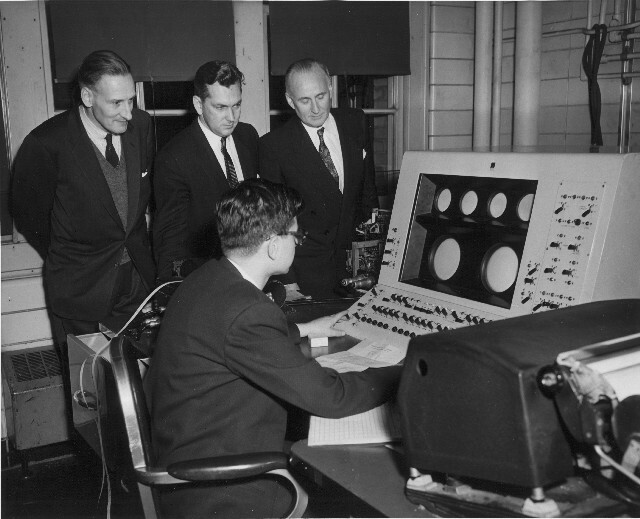 University of Toronto Computation Centre director Dr. Calvin Gotlieb at the controls of the Ferranti Mark I machine that ultimately replaced the UTEC in 1952. Image: University of Toronto Archives, digital image number 2005-42-2MS. The UTEC Jr., as it was called by the Globe and Mail, was functional by the fall of 1950, making about 5,000 calculations a second and running for periods of up to eight hours without hardware fault. Input was handled via a Teletype machine and information storage was handled by several extremely delicate Williams vacuum tubes. Despite being quite powerful compared to other computers of the day, UTEC Jr. was prone to faults. Finding the cause and correcting the problem—a bad solder joint, tube failure, or faulty circuit—could sometimes take days. The machine was also moved around this time from the physics building to the mining building, further delaying its development. In 1952, events across the Atlantic in the UK further hampered the UTEC project. Newly-elected to office, the Conservative party led by Winston Churchill cancelled all government procurements over $100,000 as an austerity measure. That meant the British Atomic Energy Authority, which had ordered a $300,000 computer from Manchester electrical engineering firm Ferranti, suddenly found itself unable to pay for its new device. The atomic energy authority’s machine was no ordinary computer. In fact, it was just the second commercially manufactured computer ever made. It sat without a buyer until January 1952, when the University of Toronto Computation Centre stepped in and purchased it. The Ferranti Mark I wasn’t as powerful as the UTEC, but in the interest of getting the centre up and running quickly, the National Research Council and Defence Research Board agreed to buy the machine and continue to fund development of a full-scale UTEC. The six-ton Ferranti Mark I was delivered to Toronto on April 30, 1952 and named Ferut (a portmanteu of “Ferranti” and “U of T” pronounced “ferret”) by Trixie Worsley. It was semi-functional by August 1952 when the Toronto Star pitted the machine against a human in a word game. Ferut lost, “because Ferut’s inability to reject the obvious as quickly as the human eye. He has to spend as much time analyzing a bad guess as a good one,” said Calvin Gotlieb. The Ferut machine was one of the first computers to be programmed remotely. 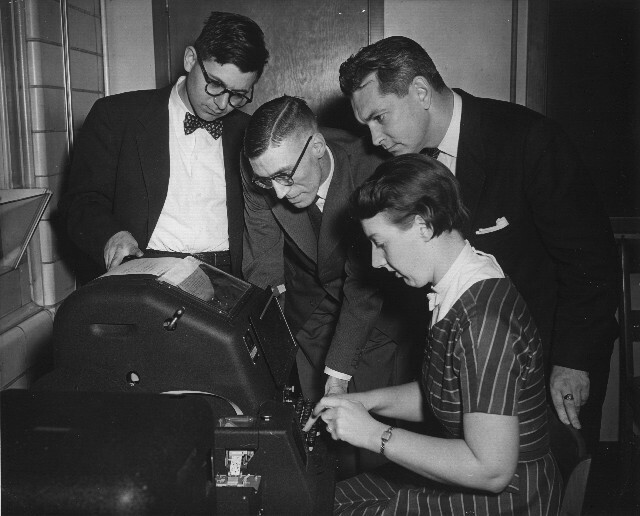 Here in 1955, a CN telegraph typist Audrey Bates enters information that will be sent to the computer from the University of Saskatchewan. Left to right: Dr. Calvin Gotlieb, C. Jenner, and an official from CN. Image: University of Toronto Archives, digital image number 2005-58-1MS. Though Ferut wasn’t intended to replace the unfinished UTEC, circumstances once again intervened. In 1952, Ontario Hydro urgently needed calculations that would determine the planned route of the St. Lawrence Seaway along the US/Canada border. The Ferut program that provided the answers in the spring of 1953 was so long and complicated the paper tape it was printed on was 1.5 miles long and consisted of roughly 2,000 instructions. The results took hours to come through, but it was considerably less than the 20 years it would have taken using regular calculators. Because the Americans didn’t have the computing power to challenge the result, the course of the seaway was based on the Canadian plans verified by Ferut. As computer science professor Michael R. Williams noted in 1994, the Ferut machine was also one of the first computers to offer remote access. Using a Teletype machine, University of Saskatchewan graduate student Bob Bruce was able to send code directly to Toronto for use in the computer. On several occasions, the paper tape fed directly out of the Teletype and into the input of Ferut. Trixie Worsley and physicist J. N. Patterson Hume wrote software that allowed those at U of T not familiar with code to operate the computer. With Ferut performing roughly as desired (it still suffered outages and errors,) the UTEC machine was gradually abandoned. Today, only a handful of pictures of it survive. Ferut lasted in Toronto until it was replaced in 1958 by an IBM 650 computer and shipped to the Structures Lab of the National Research Council in Ottawa. Throughout the development of UTEC and Ferut, those employed at the Computation Centre were acutely aware of the philosophical implications of designing and building machines that would ultimately put humans out of work. “The computer’s great advantage is that it saves drudgery and that it can do in an instant what would take a trained mathematician days or even years,” said Dr. Calvin Gotlieb. “If the computer means the burden of work will be distributed better and results in a higher standard of living, it will be a real contribution,” said Kates in 1950. Thank you to Dr. Scott M. Campbell at the University of Waterloo for kindly sharing his 2006 doctoral dissertation, The Premise Of Computer Science: Establishing Modern Computing At The University Of Toronto (1945-1964). Today, people (not just homes) may have a computer (smartphone) that is much more powerful than not just the 1950’s computer, but the computers used onboard the Apollo flights to the moon and back. Kevin comment: I do believe that honour rests with the computers that cracked the Nazi “Enigma” cipher during the Second World War. I would note your caption on the Ferut machine picture makes absolutely no mention of the woman sitting at the computer.